Eurol driver Nasser Al - Attiyah wins Dakar Rally 2019 | Eurol B.V.
Nasser Al-Attiyah and Mathieu Baumel, drivers of the Toyota GAZOO Racing team, have won the Dakar rally of 2019! A great achievement !! Eurol is official sponsor of Toyota GAZOO Racing. 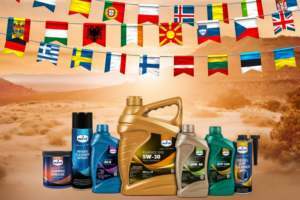 All drivers of this factory team, consisting of Nasser Al-Attiyah, Giniel de Villiers and Bernhard ten Brinke, drove the Dakar rally of 2019 with the Eurol lubricant brand.